Do you ever find yourself contemplating the big questions of the universe? After all, there’s plenty in this world to think about. For instance … Why do pets always need to be let out the back door as soon as we sit down? … Why does chocolate never break evenly into equal parts? … and just what did Bill Murray whisper into Scarlett Johansson’s ear at the end of ‘Lost in Translation’? Such deep and meaningful reflections bring me to yet another of life’s (possibly contentious) mysteries … Are cookies the same thing as biscuits? Perhaps it’s that strong historical connection between Britain and Australia which saw me grow up with people eating ‘biscuits’ rather than ‘cookies’. I may even be able to point a finger at the literary influences of my childhood, like Enid Blyton and Roald Dahl, who no doubt indirectly educated me on the distinctly British terminology of ‘biscuits’. Whatever the cause, those sweet and crispy treats of my youth such as Iced Vovos, Monte Carlos, and Scotch Fingers, were all most definitely biscuits. Growing a few years older, and following several years of American cultural education via eighties TV shows like Family Ties, Who’s The Boss? and The Cosby Show, I then came to know more about similar sweet and crispy treats known as ‘cookies’. While I happily welcomed cookies into my life, one thing has always been clear – in my mind a biscuit is quite different to a cookie. However I have come to realise that some people seem to use these terms interchangeably. Based on my own personal sweet classification system, the top image is of biscuits while the bottom image showcases the delicious choc-chip cookies I made last week. While I definitely know the difference between the two crispy treats, I must admit I struggle to eloquently define just what those unique criteria are … perhaps it is something just innately understood from childhood? What do you think? Is there a difference between biscuits and cookies for you too? (it’s probably best if we stay well clear of that whole cracker vs crispbread debate … at least for now). From my North American perspective, a cookie is small baked flat or sandwich confection and a biscuit is either a) a small savory/salty item (a cracker) or b) a larger quick bread item which you slice open and spread with butter. Hi Matt – Oh that’s really interesting … in Australia I think it would be a rare person who would potentially refer to a biscuit as something savoury … they’d just be crackers. Your second potential definition of a biscuit, ‘something that is sliced open and spread with butter’, kind of sounds something like a scone or an English Muffin from my perspective … cultural food terminology differences are fascinating. Hi Katie – I’ll have to pop over to your blog soon to check out that cookie recipe … yum! I love how you make the distinction between cookie and biscuit based on the aesthetic structure of the baked goodie … that’s pretty fantastic, and a difference I hadn’t thought of myself. I’m with you, most treats like this are biscuits, but over more recent years I’ve allowed the term ‘cookies’ into my vocabulary – for certain TYPES of biscuit. But it’s difficult to define exactly what those types are, even though I know it very clearly myself! I really don’t understand American ‘biscuits’, though. I can just about cope with the savoury crackers, but the idea of biscuits being a bread item?! No, America, no!! Biscuits are meant to be hard and sweet!! Hi Mel – I’m glad to hear I’m not the only one who struggles with the distinction between biscuits and cookies, it’s seems to be a ‘gut feeling’ more than anything. well a cookie is like a sweet treat and more chewy? a biscuit is more like a muffin type texture thats usually more savory. They are putting a busciot cafe by house and I already know I am in trouble! It’s so fascinating that biscuits are more muffin-like in America and that they tend to be savoury … in Australia our biscuits would all be sweet and most generally crispy. Savoury biscuits would be crackers. hooray for the aussie in you that knows the difference!! i feel like cookies are more chewy and can be had without a drink. biscuits definitely need to be accompanied by a coffee/tea/milo!! but like you, i can’t really put my finger on it…i think it’s the australian in us that “just knows” when a biscuits and biscuit and a cookie is a cookie. Hi Melynda – Haha … perhaps it is a clear difference in Australia? It seems the differences between, and the interpretations of cookies and biscuits vary around the world. That chewy characteristic of cookies seems to be a popular distinction … and I know what you mean about biscuits needing to be accompanied by ‘something’ – like coffee or tea. Hi Tammy – I think I’m going to have to take a trip to America to learn more about this whole savoury biscuit phenomena … it’s something we just don’t indulge in here in Australia. 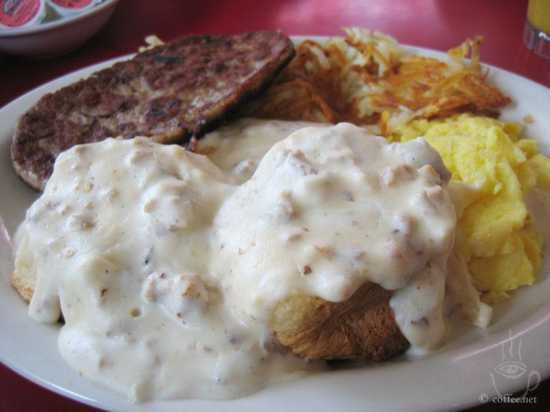 Biscuits with gravy sounds equally interesting … the closest I think we’d come is just having bread with gravy. Your take on the biscuit vs cookie issue is interesting too … and you raise a really intriguing point about the influence of Cookie Monster (I’ve always loved him). I watched it a few times I suppose, but I remember not liking it and thinking that it was really weird how they kep counting over and over and repeating the alphabet (like we were really stupid or something – haha – and the guy with the cream cakes – why did he have to drop them everywhere). I do like the fuzzy animals – I did love the Muppets on Sunday night that’s for sure. I think I’d agree with your classification system. Cookies are bigger than biscuits… but don’t start me on buns and muffins. How about cup cakes and muffins?? A cookie is a cookie, but here in the Southern US, a biscuit is a quickbread that is ideally served for breakfast with large amounts of sausage gravy (with tons of pepper), eggs and grits (cheese grits optional) and maybe some bacon. Hi jdaddyo – This biscuit as a bread scenario has me completely intrigued … I’ve never come across that before doing this post … I wonder how many references from American TV shows I’d misinterpreted? Biscuits are in the same branch of the bread tree as English muffins (which seem to be related to crumpets), but they are more bread-like. They use baking powder, not yeast, and some versions use shortening. They are also used to make yummy breakfast sandwiches. I grew up under the British English influence so yes, I am completely the same in regards to Picture 1 and 2. They ARE different! Although I’m tempted to believe that most cookies *are* biscuits but no biscuit is a cookie. You know what I mean, right? Right?! Hi Katie – Yes, it does seem to be that British connection that has us feeling a similar way towards cookies and biscuits … I’m so glad to hear that many of my lovely readers agree with me on that front. I agree with the dry/chewy distinction. For me, it also has to do with whether they are freshly baked or mass produced. The former are cookies, the latter biscuits. I think they perhaps also lean more toward being cookies dependent on how much fun they are…it’s not as awesome to be a biscuit monster! Hi Hayley – Hmm, that’s another interesting point about the freshly baked vs mass produced nature of these sweet treats. That’s another side of the argument that I hadn’t thought about before. Haha re the pets wanting to go out as soon as we make ourselves comfortable (or as soon as I’ve gone to bed, in Suki’s case). I really like the wisdom you’ve brought along to the cookie / biscuit debate. I hadn’t thought about differences in baking methods before … I would tend to agree that a biscuit is something rolling out and cut, rather than the freeform nature of cookies. I just don’t get that bread-y ‘biscuit’ idea that seems to be a common reference point in America … like you, I would think the closest we have here is a scone. Haha, I definitely couldn’t imagine dipping a sweet biscuit into gravy either … yuck! So it’s clear the American vs Australian biscuit ideas are vastly different. Hi Pearl – Haha … it’s all a bit of a confusing world at times isn’t it? (especially when it comes to sweet treats!). I’ve always wondered what did Bill Murray whisper into Scarlett Johansson’s ear at the end of ‘Lost in Translation’! Oh, ‘biscoito’ is rather charming … so yes, it sounds like you’re in the biscuit ‘camp’ (a lovely place to be). I hope all is well in your world, dear friend.